"Mataro" redirects here. For the wine grape, see Mourvèdre. For another wine grape that is also known as Mataro, see Carignan. 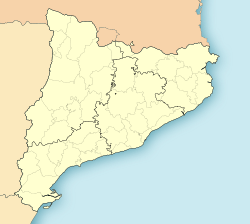 Mataró (Catalan pronunciation: [mətəˈɾo]) is the capital and largest town of the comarca of the Maresme, in the province of Barcelona, Catalonia Autonomous Community, Spain. It is located on the Costa del Maresme, to the south of Costa Brava, between Cabrera de Mar and Sant Andreu de Llavaneres, 30 kilometres (19 miles) north-east of Barcelona. As of 2010[update], it had a population of c. 122,932 inhabitants. Roman villa of Can Llauder. Mataró dates back to Roman times when it was a village known as "Iluro" or "Illuro". The ruins of a first-century BC Roman bath house (known locally as the Torre Llauder) were recently discovered and can be visited. The coastal N-II highway follows the same path as the original Roman road. The first railway in peninsular Spain was the Mataró – Barcelona line which opened on 28 October 1848 by the Catalan businessman and Mataró native Miquel Biada. This line now forms part of the RENFE/Rodalies de Catalunya R1 suburban service between L'Hospitalet de Llobregat and Maçanet-Massanes. Mataró is also connected with Barcelona and Girona by the C-32 autopista (freeway) and with Granollers by the C-60 autopista. 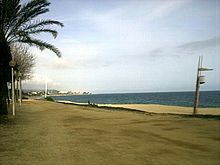 During the 1992 Summer Olympics in Barcelona, Mataró was the starting point for the marathon events. Nearby the town are the archaeological remains of the Roman villa of Can Llauder. The traditional vineyards were devastated by Phylloxera in the nineteenth century and only partially replanted, due to the growth of the tourist industry and the development of irrigation in the area. Potatoes were one of the first replacement crops to be introduced, especially the Royal Kidney variety, and Mataró obtained a Denominació d'Origen in 1932. Trocadero lettuce and peas are also grown, mostly for export. The production of cut flowers is less important than in other towns of the Maresme. Irrigated land made up 9.13 square kilometres (3.53 sq mi) of the 10.57 square kilometres (4.08 sq mi) of agricultural land in the municipality in 1986 (47% of the municipal territory). 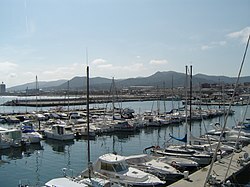 Mataró has a borderline humid subtropical climate (Cfa in Köppen climate classification) bordering with a Hot-summer mediterranean climate, (Köppen Csa). The three wise men in Mataró. Carnival in Mataró: celebrated immediately before Lent. Saint George in Mataró: celebrated on 23 April. It is a big celebration although it is not a bank holiday. Les Santes: local festivity of the city celebrated at the end of July. It involves the recognition of Saint Juliana and Saint Semproniana. The Tió: celebrated in Catalonia on Christmas’ Eve, 24 December. Mataró also celebrates several fairs such as:Tres Tombs and Saint Ponç In May it is celebrated a fair called Mercat de Sant Ponç. At the fair handicraft products, medicinal herbs, natural products like: honey, cheese, fruits, flowers, jam and salami are sold. Sant Ponç is the patron saint of the herbalists and bee keepers. The fair has been done for centuries. Its origins date to the 16th century, when in Spring herbalists took medicine to the sick. Today Sant Ponç fair is celebrated to preserve the antique customs. International Dance Festival "Days of Dance". ^ a b "Ajuntament de Mataró". Generalitat of Catalonia. Retrieved 2015-11-13. ^ "El municipi en xifres: Mataró". Statistical Institute of Catalonia. Retrieved 2015-11-23. ^ 1992 Summer Olympics official report. Archived 28 May 2008 at the Wayback Machine Volume 2. pp. 204-6. ^ Source: Catalan Wikipedia. This Denominació d'Origen is not currently (2006) protected at European Union level (see list Archived 17 January 2007 at the Wayback Machine). ^ "ESP BARCELONA - MATARO". Wikimedia Commons has media related to Mataró.